It’s back-to-school time in the Okanagan! Just like our clients, many members of the Valhalla team are thinking again about daily schedules, making lunches (ugh! ), and after-school activities. How does a helicopter stay up? Well, grab your notebooks and pencils, everyone! Today, you’re going to learn all about the very cool science that keeps our “birds” up in the beautiful Okanagan skies. Humans have attempted to build flying machines for ages. In the early 1900’s, several aviation companies put out early designs for helicopters, but none were commercially viable. That changed in 1931, when the now infamous Igor Sikorsky patented his machine; it was in production by 1942. The Sikorsky helicopter is the prototype for almost all commercial helicopters today. Like all aircraft, helicopters can fly because they have something forcing the air pressure around them to change. Sikorsky and other aeronautical engineers of his era recognized that a successful helicopter needed to combine 2 sets of scientific principles: lift & drag, and thrust & weight. An aerodynamic force that lies perpendicular to the flow coming against it. In a helicopter, this lift is achieved with the horizontally-aligned rotary propellor that pushes away from gravity. Lower air pressure below the body of the aircraft allows the machine to push off the ground. Lift, as you might guess, makes the heli go up. Up in the sky, drag is lift’s evil twin. Drag is essentially air resistance. It creates friction that opposes whatever force is moving against it: it slows everything down. In our case, it’s the force that keeps the copter from flying off too fast! 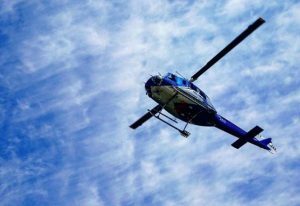 If the force of the lift is equal to the force of the drag, the helicopter will hover in mid-air. This is a propulsion force the pushes air in the direction of flight. In a helicopter, thrust is created by the engine, and is used to start airflow over the blades, to stabilize the weight of the aircraft, and to control the speed of forward movement. Well, this one is easy. It refers to how much the helicopter weighs (no surprise, there). It’s used to determine just how much thrust and lift will be required to get off the ground! If the force of the thrust is greater than the force of the weight of the machine, the helicopter will move. So that’s how Sir Isaac Newton and his laws of physics play into keeping our helicopters in the air, but those aren’t the only important elements. The body of the helicopter, the fuselage, is made of strong, lightweight materials (usually a composite of fiber-impregnated resins and aluminum or steel). It houses the engines, the gearboxes and controls, the control panel, the communication system and, of course, the seats and safety harnesses. Attached to the outside of the aircraft, you’ll find the hardest-working components! Helicopters are considered rotary wing aircraft. The blades of the rotor are shaped like the wings of an airplane, slightly curved and exceptionally aerodynamic. Each blade can move individually (controlled by the pilot’s hands and feet), to change the amount of air pressure above and below the body of the heli. At high speed, the curve of the blade forces the air above it to move faster than the air that is passing underneath, which is what creates the change in pressure. As long as the blade is spinning fast enough (and depending upon the angle of each blade), the helicopter can remain aloft! In order to move forward and backward, side-to-side, or to descend, the pilot needs to adjust the angle of the blade. Increasing and decreasing the pitch of the blades (either individually or collectively) alters the movement and the hover of the entire machine. In order to turn the machine left or right, though, the pilot needs to affect the blades of a different mechanism: the rear rotor. But why do helicopters have two rotors? The rear rotor creates a resistance force upon the airflow from the first propeller. This aids stabilization, hovering, and most importantly, spin. This counterbalance is what keeps the helicopter from getting into an uncontrollable spiral, and what keeps it from crashing. We are big fans of the rear rotor! It all sounds very complicated, but it actually makes a lot of sense. 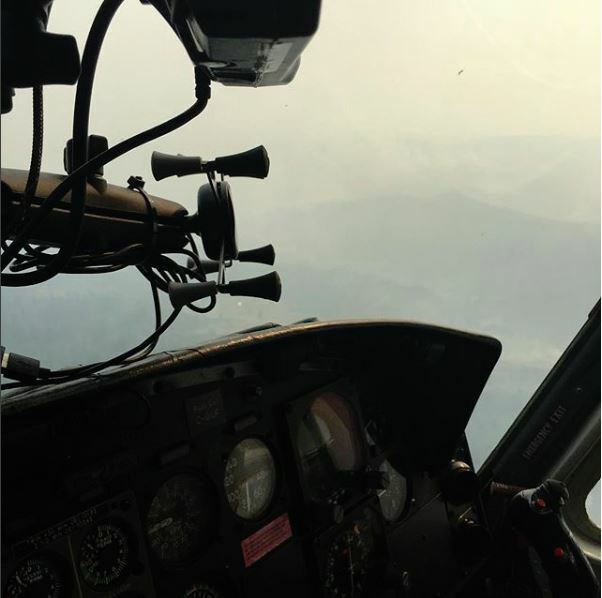 Helicopter pilots need to have a strong understanding of physics, and excellent hand-foot-eye coordination in order to safely control their aircraft. At Valhalla, we’re proud to have a team of exceptional, meticulous, passionate, and very coordinated pilots, engineers, and crew to make our helis soar! Get in touch with us today to put our skills to the test (we’re sure to pass with flying colours! ).